Fifteen years ago, a murder-suicide in room 712 rocked the grand old Bellweather Hotel and the young bridesmaid who witnessed it, Minnie Graves. Now hundreds of high school musicians, including quiet bassoonist Rabbit Hatmaker and his brassy diva twin, Alice, have gathered in its cavernous, crumbling halls for the annual Statewide festival; Minnie has returned to face her demons; and a colossal snowstorm is threatening to trap them all in the hotel. Then Alice's roommate goes missing—from room 712. The search for her entwines an eccentric cast of characters: conductors and caretakers, failures and stars, teenagers on the verge and adults trapped in memories. For everyone has come to the Bellweather with a secret, and everyone is haunted. 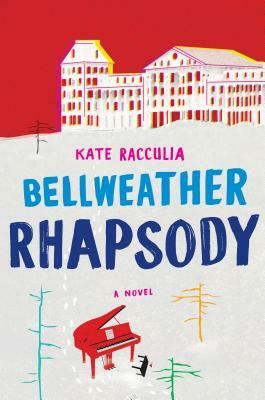 Bellweather Rhapsody is a genre-bending page-turner, full of knowing nods to pop culture classics from The Shining to Agatha Christie to Glee. But its pleasures are beautifully deepened by Kate Racculia's skill with her characters, her melancholy, affecting writing about music, and her fearlessness about the loss and darkness that underline the truest humor. This is a wholly winning new novel from a writer to watch.